"My latest series of works are inspired by nature; many of the pigments used are made by me from the earth's elements." Barron has shown in many group exhibitions across the nation including the Athens Center for Contemporary Art, the Museum of Contemporary Art of Georgia, the Atlanta Contemporary Art Center, the Art on The Beltline, the Art Center in Xi’an, China, Fe Gallery in Pittsburgh, and Umbrella Gallery in New York City. Her films have been in numerous film festivals throughout the United States. 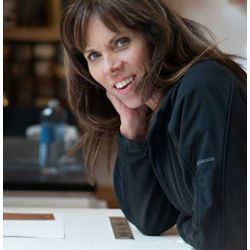 Her work is included in several private and public collections including the Four Seasons in Morocco, the Museum of Contemporary Art of Georgia, the Marriott Courtyard in Nashville, the March of Dimes Corporate Office Collection, the APG Collectors Portfolio, Rensing Art Center and Straw-Hat Press. Rose has been awarded and completed numerous artist residencies including Taller Portobelo, the Hambidge Center for the Arts and Science, University of North Texas, Rensing Art Center and Straw Hat Press. Currently, Rose works at the Art Institute of Atlanta as a part-time adjunct professor in the Foundations and Photography Department. "At times, my pieces evolve to an unexpected closure where I'm not quite sure how it happened or how it got there; that’s the intuitive creative power at work I guess." "My intention is for people to enjoy looking at the work, to sense the beauty in it. And upon taking a deeper look, to feel a connection to my work, whether that be to their own identity or someone close to them, as well as to open up an awareness and sensibility of our existence and our place in the world." "Probably the most entertaining stories are within the collaborative work I stage and photograph when I work with other artists whom are very creative humans; words, actions and rawness comes out!! It's quite fun." "I actually love all materials but if I have to pick a least favorite, I would say metals because I’m not familiar with it. It is such a specialty and I admire those who work with it." "This space varies so much but I find it is best in an authentic space where others, such as gallery owners or curators, know me and my work and can elaborate upon it when I am not there. ."
"My inspirations often come from nature, my identity as a woman (and how that fits in with our culture), past life and our connection to the world. I love experimenting with different disciplines of art. I use inspiration, sketches, and notes when creating, but throughout the process, I allow pieces to evolve on their own and it becomes a dance if you will. If a piece changes from my original idea, I welcome it as I believe the artworks have a voice of their own. I am a multi-media artist who refuses to stay in her box of titles."